The Airedale Terrier is prone to hip dysplasia, eye problems and skin infections. It is important that when contacting a Airedale Terrier breeder that you express health concern issues and ask the breeder what they are doing in order to help mimimize them. Please don't purchase your Airedale Terrier from a petstore which commonly are known to support Airedale Terrier puppy mills. Doing so only promotes inproper breeding ethics and promotes current Airedale Terrier health issues. 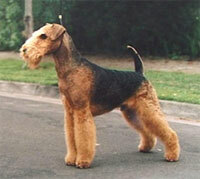 The AKC, UKC, CKC, FCI, SKC, WWKC, FIC registries recognize the Airedale Terrier breed standard. Country of Origin: Known as the King of Terriers and originating in Yorkshire, Airedale Terriers were originally developed to hunt otter and vermin. The progenitor was most likely the extinct Black and Tan Old English Terrier. Character: Stubborn, loyal, quiet and intelligent. Temperment: Patient around children and tolerant of other pets. May try to dominate other dogs. Coat: Is smooth, hard, and wire-haired. Care Coat requires little grooming and the hair should be plucked a couple of times per year. Comments: The Airedale is loyal, trustworthy, obedient, loving, courageous, sensible, affectionate, tolerant, eager to please and above all fun. Natural guard dog.